In my line of work, I stare at shades of black. My work starts on dark, black nights, when there is no moon or reflection from it. The telescopes I use have to be in places with three qualities: High, dry, and—you guessed it—very dark. And so, I search for planets atop the summit of the highest, driest, and darkest peak in Hawaii. 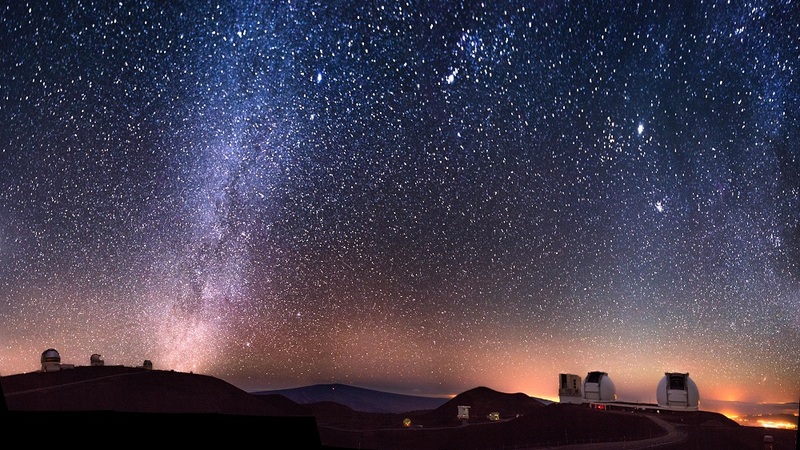 Mauna Kea, a dormant volcano—where the world-famous Keck Observatory is located—minimizes the “noise” in the images from Earth’s constantly swirling atmosphere and the light drifting in from cities. Because black is defined by the absence of light, you might not think there are different gradations of black—but there are when you are hunting for other planets in our galaxy. Every day, I am looking through images that appear, at first, like exposures devoid of any light. In reality, shades of black can hide amazing worlds—some of which could be habitable or inhabited by life forms. Seeing the color black in fact is a comforting affirmation that I’m searching in the right direction, for a planet must be so faint as to appear to not be there at all. If an image has many bright dots of light, that means I am looking at a field full of stars. I am not interested in objects that emit their own light. A star is too extreme an environment for life as we know it—it’s an enormous ball of hot plasma and even if it had a solid surface to stand on, which it doesn’t, life forms like us would get crushed under the star’s tremendous gravitational pull. What I’m trying to find are very faint objects that reflect and re-emit the light from a host star nearby. These planets outside our solar system—which are known as exoplanets—are companions to stars, swimming in their own sea of darkness. Finding these planets tells us about the architecture of planetary systems. It also lets us know how common exoplanets are in the habitable regions around stars, where the temperatures are not too hot and not too cold, where liquid water can exist, and complex molecules may have figured out the processes we call life. 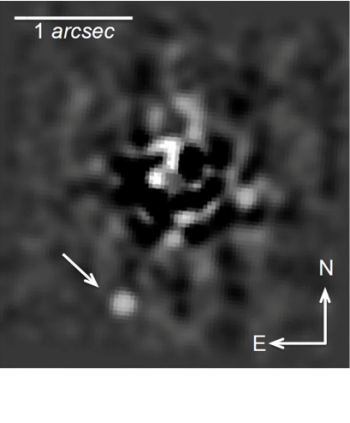 Sample image of searching for a planet around a mature star, taken in March 2016 with the NIRC2 camera on Keck II telescope. My research uses the newest planet-hunting technique—“direct imaging.” Put simply, we place a small piece of black film in the field of view of the telescope to dampen the light from the parent star. Then, astronomers like myself can make out the faint planet companions orbiting the star. We rotate the powerful Keck telescope, taking pictures in a time-lapsed sequence, and then apply an intensive mathematical data analysis procedure. Through this process, we can carefully distinguish the feeble signal of a planet from the overwhelming glow of the host star. The dark piece of film is called a coronagraph, and it is a key component of the direct imaging technique. That’s right, I am actually trying to make the picture darker because the natural blackness of space is not enough to be able to see what we want to see. In order to extract the signal of a planet in an image, there is a lot of interference I have to take out: the random noise from the camera’s own electronics, the scattered light around the coronagraph, and the rotation of the individual exposures. The final image, a deeper tone of black, is the result of stacking cleaned-up exposures to reveal a clear signal from the planetary system. Galileo Galilei, the first observational astronomer, would be fascinated to see how we’ve progressed in the last 400 years. We are now seeing planets in the blackness around other stars, very much in the same way he discovered the faint moon companions around Jupiter. I did not set out to stare at blackness all day long. I came to astronomy by way of mathematics, which is a great tool for designing ways to see very small perturbations in data. But as I learned more about how astronomy could help expand the boundaries of human knowledge, I became more and more interested in trying to see what the universe conceals in the darkness. Ultimately, this is what all research is—seeking light in the darkness of the unknown. Our bodies are limited by the sensitivity of the human eye, but we have expanded our searches by manipulating the pixels of more sensitive cameras, and can thus capture evidence of real physical phenomena with our machines. If humans are to learn about how we came to be and search for life beyond ourselves, we must continue to look for answers in the deep blackness of space. And of course, we have to combine that with a little patience for staring into what may seem like a lot of nothingness. Farisa Y. Morales is a research astronomer at NASA’s Jet Propulsion Laboratory in Pasadena, California, and teaches astronomy and physics courses at Moorpark College and Cal State Northridge. This essay is part of The Meaning of the Color Black, a special package of stories from Zócalo Public Square. Primary Editor: Jia-Rui Cook. Secondary Editor: Lisa Margonelli. *Main photo courtesy of Andrew Richard Hara/Ena Media Hawaii. Interior image courtesy of NASA/JPL.